1. The learners tend to report everything in the present tense, as we do it in German. They are not aware of the fact that English speakers tend to look back at the situation and report it as a past event. In their minds English speakers seem to be thinking something like “When I spoke to her…..” … she told me that she liked fantasy books more than love stories. 2. On the other hand, this rule is not always true. Native speakers do not always follow the well-known grammar rule of “back-shifting the tenses”. Ann: We might get her a book, she’s such a readaholic. Sue: Yes, she told me that she loves fantasy books, let’s get her the latest Maze Runner. Obviously, Sue is focusing on a present situation here that is highly relevant at the moment of choosing a present. It’s the fact that Mary LOVES these books, not the fact that she told her about it at some time in the past. How can we explain this to our learners? David Newby, in his Grammar for Communication distinguishes between Reporting and Announcing. When we report, we sum up what we have heard, referring to a past situation in a neutral way. The witness stated that he had seen the two burglars climbing in through the window. In the final TV discussion both candidates said that they would lower the taxes and raise the pensions. When we announce, we talk about a situation or facts that seem highly relevant and present in our minds. Asma told me that she has never learned to swim. So let’s be very careful when we take her to the lake. This tricky difference is described in detail in a very interesting, helpful article by Ian P. Harman. 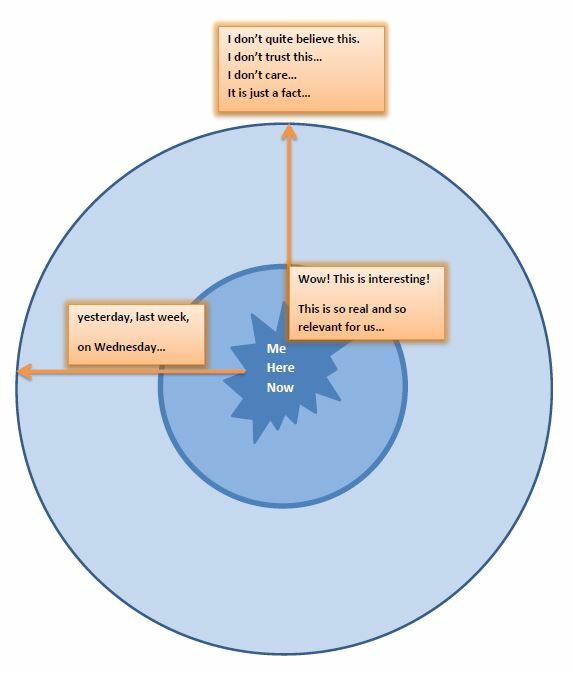 I have used his concept of the deictic circle very successfully in my teaching of reported speech. Here is my reporting circle. It explains Harman’s concept in very simple terms. Students write their sentences into this circle. For each sentence they decide how close to the center or how far out they want to put it — and how this location can help them to decide which tense to use. What might they have said?